New York, NY (February 5, 2019) — There’s still time to book a luxury winter travel getaway, whether it’s skiing or snowboarding or simply enjoying the beauty of the season while soaking in healing hot springs or sitting by a crackling fire. From snowy mountains, glaciers and icy waterfalls to panoramic city and alpine views, the outdoors are stunning during winter and vacation options abound both within the United States and abroad. 1. Whistler, British Columbia, Canada – Located 75 miles north of Vancouver are snow-capped peaks, slopes for novice, intermediate and skilled skiers, challenging hiking trails, and, of course, luxury resorts. 2. Lake Tahoe – The panoramic views are perfect while hiking or skiing across 2,000 acres of imposing snow-capped mountains that straddle California and Nevada. 3. Bergen, Norway – A funicular takes vacationers up to the tallest of Bergen’s famous Seven Mountains, with the option to ski or snowshoe down hiking trails to the city center. 4. Yosemite National Park – The highest peaks of the park’s mountains offer amazing tubing, snowboarding and skiing opportunities, and are surrounded by alpine vistas and towering waterfalls framed by giant sequoia trees. 5. Warren, Vermont – A favorite is sampling the region’s famous maple syrup before or after exploring the local wildlife or taking on one of the 150 expert-rated skiing and snowboarding trails. 6. Saariselka, Finland – Overnight accommodations include staying in a glass igloo or a hotel located within the world’s largest snow fort, after having spent the day on a reindeer-drawn sleigh ride through a snowy forest. 7. Nagano, Japan – Surrounded by miles of mountains and plateaus, vacationers can sit in one of the world-renowned healing hot springs after a spectacular day of skiing. 8. 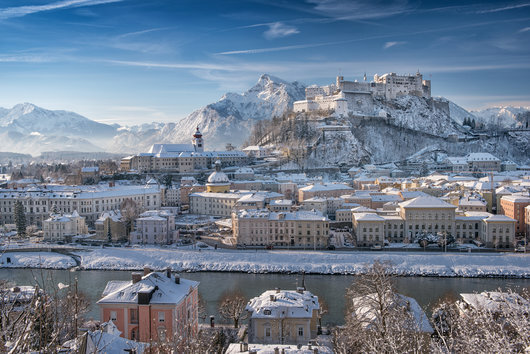 Salzburg, Austria – The snow-covered forests and meadows provide the perfect backdrop for an excursion on a horse-drawn carriage. Or enjoy alpine skiing, snowboarding or cross-country skiing in the Alps, followed by a cup of mulled wine and a little wiener schnitzel. 9. Prague, Czech Republic – During winter, ice skating rinks literally pop up around Prague, in addition to the large rink at Na Frantisku near the Convent of St. Agnes. Vacation travel experts also recommend touring the 14th century City Hall and nearby medieval astronomical clock. 10. Val Thorens, France – Located at 7,500 feet above sea level, the world’s largest ski area contains more than 370 miles of ski-in, ski-out trails and panoramic views of six glaciers. In addition to freeride skiing and snowboarding, adventurous travelers can take the chilly plunge and go ice diving. For additional information, visit Vacation online. Vacation inspires, informs and guides travelers throughout their planning process, making every step—from researching a destination to connecting with the ideal travel expert—as rewarding as possible. The content-rich website is powered by Travel Leaders Group, www.travelleadersgroup.com, one of the industry’s largest travel agency companies, with over 7,000 locations. Check out Vacation at www.vacation.com or on social media at #LoveUrVacay. Travelers also have access to The Travel Collection by Travel Leaders Group, a selection of travel offers and discounts available at no additional cost to holders of select American Express® cards. For more information visit TheTravelCollection.com. (www.travelleadersgroup.com), which is home to more than 52,000 travel agents in the U.S., Canada, Mexico and the United Kingdom. Check out Vacation at www.vacation.com or on social media at #LoveUrVacay.